There was an incredible storm last night; monsoon rains, lightening that looked like it was going to slice the building across the street in half. 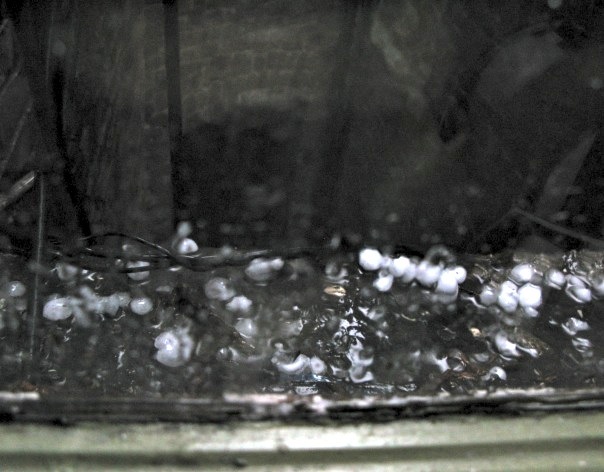 But the most dramatic was all the chunks of hail that came down in such numbers I was sure all my windows would shatter. It was like machine guns spraying my apartment from all sides. This is looking out the window over the airshaft. It doesn’t capture the excitement, but I like the dark, dreary, New York City tenement look of it. I was stuck in the Nashville airport for nine hours, waiting for this storm to pass. It’s not a bad airport at all — I highly recommend it for long flight delays because it’s small, clean, and Southerners are soooo polite. I’m checking in to see how Mr. Buddy is doing, so I’m glad to hear he was suave as usual during the downpour. Thank you for checking in. Buddy is doing well. I had to up his steroid dose a little, it’s a constant vigil!